If you're interested in hydraulic engineering, this hydraulic jump calculator will be right up your alley. With its help, you can determine all characteristics of a hydraulic jump, including the flow velocity up- and downstream, the height and length of the jump, and the total head loss. We will also provide you with a Froude number equation and teach how to use it to identify the type of hydraulic jump. Make sure to take a look at the Reynolds number calculator, too! By definition, hydraulic jump happens when the flow of a fluid changes from supercritical to subcritical. The abrupt change in flow characteristics is accompanied by substantial energy losses, as well as turbulence in the flow. The video below illustrates an example of a hydraulic jump (which occurs at the end of the video). You can observe a change of water level, as well as a turbulent transition zone. Subcritical flow (also called a slow flow) - flow depth is higher than the critical depth. D is the flow depth. If the value of the Froude number is greater than one, the flow is supercritical. If it's smaller than one, the flow is supercritical. Let's examine the Froude number equation more closely. As it is a dimensionless number, the denominator must be expressed in the units of speed - meters per second or feet per second. But does this value have any physical interpretation? In fact, it does. The value in the denominator, √(g * D), is the velocity of wave propagation, also called the wave celerity. For example, if you threw a pebble into the water, it would create ripples on the surface that would propagate with this celerity. If the flow is supercritical (Fr > 1), the velocity of the flow is higher than the celerity. It means that any waves or disturbances in the flow are transmitted downstream. On the other hand, if the flow is subcritical (Fr < 1), the velocity of the flow is smaller than the celerity. Waves and disturbances in the flow will propagate upstream. What happens in the case of a critical flow? As Froude number is equal to 1, velocity will be equal to celerity. In this scenario, any disturbance in the flow will stay in one place, moving neither upstream nor downstream. Our hydraulic jump calculator analyzes the phenomenon of a hydraulic jump in detail. It finds multiple characteristics, even including jump efficiency. The jump occurs from a supercritical to subcritical flow. B is the channel width (in m or ft). Fr₁ is the Froude number of the flow upstream. The equation determining the length of a hydraulic jump has been found in numerous field and laboratory experiments. You should remember, though, that this is only an approximation - the real length of the hydraulic jump might vary depending on many additional factors such as the flow turbulence. The way a hydraulic jump looks like depends strongly on the Froude number upstream Fr₁. The ranges below show different types of jumps that differ in the flow patterns. Fr₁ < 1.7: undular jump. The jump is minimal, which results in small undulations on the surface and very low energy loss. 1.7 < Fr₁ < 2.5: weak jump. the jump is still considered small, and the energy dissipation is quite low. 2.5 < Fr₁ < 4.5: oscillating jump. Irregular waves are generated during this jump. Energy losses start to be considerable. 4.5 < Fr₁ < 9: steady jump. The jump is steady and constricted to one location. Energy losses can reach 70%. Fr₁ > 9: strong jump. In such jumps, supercritical water jets are formed, the difference in velocities up- and downstream is high, and the energy dissipation can reach 85%. 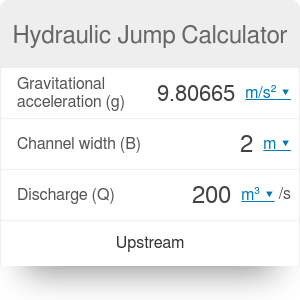 Hydraulic Jump Calculator can be embedded on your website to enrich the content you wrote and make it easier for your visitors to understand your message.